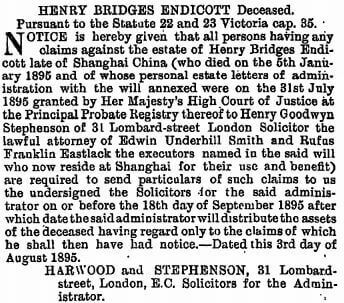 HF: “Henry B. Endicott joined Butterfield & Swire as Head Shipping Clerk in February 1873, after being headhunted from the US firm of Augustine Heard & Co. An American and a fluent Chinese speaker, he was known to have excellent connections throughout the chartering and shipping community, and John Samuel Swire believed he was the right man for what he envisaged would be a fight to the death with China Navigation’s main rival on the Yangtze, the Shanghai Steam Navigation Co. The pair made a ruthless team and some of their imaginative, if questionable, canvassing methods would have startled their Taipan, had he known of them at the time. When Russell’s were suspected of offering sweeteners to charterers to secure cargo, Endicott had no qualms about doing the same. Russell’s Manager, R.B. Forbes, was soon bleating: ‘Cargo promised to us is taken away to their steamers, …our oldest and best friends among local freight agents tell us that the opposition offers so much better terms…’. 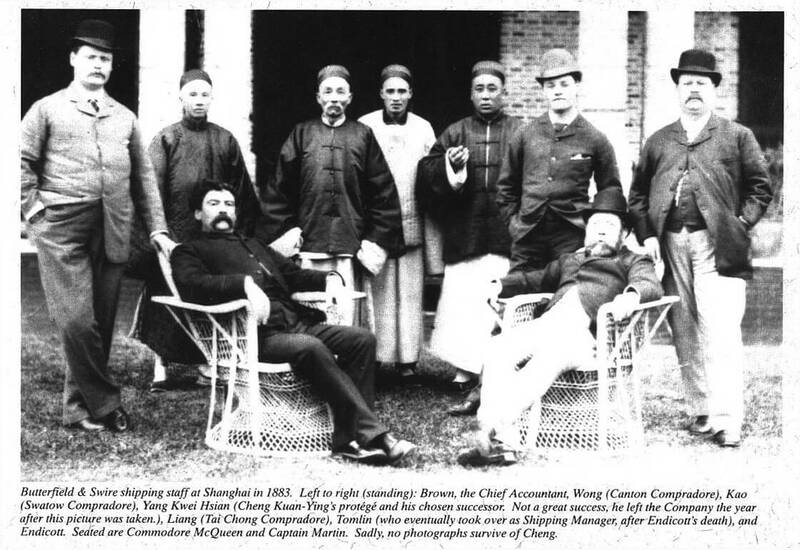 In 1882, Cheng moved on to greater things when he accepted the position of Assistant Manager of the governmentcontrolled China Merchants Steam Navigation Co. – a company that had come into being at about the same time as CNCo and had rapidly grown in importance, taking over the Shanghai SNCo after its bankruptcy in 1877. He later wrote that it was with mixed feelings that he eventually took the decision to leave Swire, because of his high regard for the firm’s business ethics. On Cheng’s recommendation, his protégé, Yang Kwei Hsian, took over his role of CNCo comprador alongside Endicott. But, two years later, Yang suddenly committed suicide and it was discovered that he had been pocketing large amounts of CNCo freight. For fraud on such a scale to have gone undetected pointed to an inexplicable lack of judgement on Endicott’s part: naively, he had assumed he could place the same level of trust in Cheng’s chosen successor. In customary fashion, comprador Yang’s good character had been secured by three financial guarantors – one of whom was Cheng. But the amount of the loss was so great that the men had no hope of repaying it. The matter ended in court and was finally settled with CNCo writing off half the amount, while Yang’s guarantors gave promissory notes for the balance – which they duly honoured. It was a costly lesson and highlighted the iniquities of the outmoded comprador system.